It is Monday morning at Embassy Golf Links' Corporate Park in Bangalore and a view west from the top floors of the mammoth office complex is hundreds of barren acres of Indian Army-owned land, including a firing range. On terra firma, it is an ant farm. Hundreds of employees are rushing to offices of the most storied global technology brands such as IBM, Microsoft, Dell, and Yahoo! Nestled in the ground floor of a building named Pebble Beach - each building in the complex is named after a famous golf course; this one has as its namesake a course near Palo Alto, California - is the very crowded office of a little known company, InMobi. You are unlikely to have heard of InMobi but if you play Angry Birds on your Android smartphone, it is this Bangalore company that powers the advertisements that pop up on the top right corner of the screen. Much like in Internet advertising, a mobile advertising company acts as an intermediary between the advertiser and the content owner or publisher. Unlike the Internet, a lot of mobile advertising is on applications, a fad started thanks to the immense popularity of the iTunes App Store for Apple's iPhone. On average, an ad network such as InMobi keeps between 30 and 40 per cent of the revenue per ad, giving the rest to the publisher. The more ad traffic the network serves, the more will advertisers queue up. 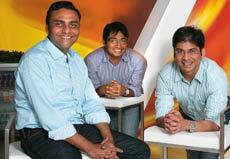 Naveen Tewari, the man running InMobi, looks more boyish than his 34 years. He and three co-founders have managed to create a company that should exceed $100 million, or about Rs 500 crore, in revenues in 2011. That is small change before the money that Google, the King Kong of online search and advertising, will make from mobile advertising in 2011. Its revenue run rate - the money it would make in a year if business continues as now for the company - for mobile advertising is at $2.5 billion compared with $1 billion made in calendar 2010. But a scorching growth in the mobile advertising market - Swedish mobile consultancy Berg Insight projects it at some $18.65 billion in 2015 - had the Tewari-run company valued at over $1 billion this September when Japanese media and telecom company SoftBank invested $200 million in it. This is the largest single investment in any Indian digital company. The "partnership," SoftBank founder Masayoshi Son said in a statement, "will help SoftBank become the number one Internet company in Asia". 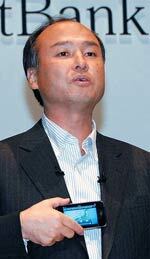 SoftBank has businesses in broadband, telecom, finance and media in Asia, primarily. eals of such size among start-ups are not common in India. Private equity firm Warburg Pincus valued mobile phone firm Bharti Televentures (now Bharti Airtel) at $1.5 billion, when the mobile phone firm's business was just five years old, in a 1999 deal. Such expectations sit lightly on Tewari's shoulders. So what if InMobi is pitted directly against Google, which has a 60 per cent market share today? Even if the Berg prediction for mobile advertising plays out, that sliver will make for only 3.4 per cent of the global advertising market, leaving plenty of headroom even after. InMobi says it is second behind Google with Tewari estimating a market share of more than 10 per cent. "We will be a billion-dollar revenue company within three years," the CEO says. With the company serving up 50 billion advertising impressions every month at last count - double the number it used to do in 2010 - the opportunity to grow huge lies right before this 400-person company, which recently opened its office number 16 in Seoul. He is not your usual 30-something, cocky multimillionaire. Despite his company being worth around a billion dollars, Naveen Tewari still drives a Honda City and flies Economy Class. His father was a professor at IIT Kanpur and so was his grandmother, "Sometimes I wonder if my family is disappointed I did not become a teacher," he says. Tewari is persuasive. He managed to not only cajole his co-founders into quitting their jobs and join InMobi, but also persuaded several of his employees to leave their high-paying jobs at Google, Microsoft and Yahoo! and join his company. Nikhil Pahwa, Editor of technology website Medianama. com, goes as far as to say: "Investors are not just investing in InMobi and the idea behind it, they are investing in Naveen Tewari." Married, with a four-year-old daughter and a son less than a year old, Tewari says he misses his family a lot as he travels 20 days a month, but he knows he is on to something big. He wants to make InMobi a company with over a billion dollars in revenues by 2014/15, well before he turns 40. His confidence and determination are infectious, as is his casual dress sense. Infosys's N.R. Narayana Murthy has complained about the quality of IIT students. InMobi is an example of what young IIT-ians can do. If Tewari succeeds in creating a billion-dollar company within seven years of starting up, it will be a remarkable achievement. Especially, since he nearly flamed out - not once but twice. Late in 2006, Tewari returned to India after a six-year stint in the United States, where he attended Harvard Business School and for most part worked at consultancy McKinsey & Company and California venture fund Charles River Ventures. But he always wanted to "do something" himself. He had by then convinced two of his closest friends from the Indian Institute of Technology, Kanpur, Amit K. Gupta and Abhay Singhal - from the 2000 and 2001 batches, respectively - that mobile phones were where the future was. Earlier that year, he had convinced Mohit Saxena, an IIT, Roorkee graduate, to become the tech brains at his venture. The venture was an SMS-based mobile search. With half a million dollars funding from angel funding network Mumbai Angels, mKhoj set up shop in Mumbai in July 2006. But much like other local search companies such as Guruji and AskLaila, things were not easy for the quartet. Mobile search was a grandiose idea, says Tewari today, but the market was not ready for it. The same proved true about mKhoj Version 2.0, when it changed its model to a mobile-based deals company, specifically for Mumbai. Singhal, who heads global ad sales for InMobi today, talks about the difficulties of sending 50 agents to over 18,000 different stores across Greater Mumbai. "We managed to sign up 3,000 stores, but there were cases of agents running off with money and it became an almost impossible logistical job," he says. With credit card bills already maxed out, Tewari needed a new idea and fast, and after some frantic discussions among the four founders, it was decided they would give mobile advertising a try. Saxena, who is today Head of Technology at InMobi, says everything began from two rented servers in Mumbai and this carried on while the deals business continued apace. That was also when Tewari met several venture capital firms, trying to raise money for the latest idea. Most shot him down, sometimes after day-long presentations. In May 2007, a meeting with Ajit Nazra of Kleiner Perkins Caufield & Byers, or KPCB, the firm that bankrolled the likes of Google and Amazon, and Ram Shriram of Sherpalo Investments changed all that. Less than half an hour later, Tewari walked out with a deal for an investment of $8 million. In less than six months, the company "picked up the tentpoles and moved to Bangalore to chase talent," says Tewari. The smarts of the core team attracted talent, often from multinationals. For instance, IIT Madras graduate Sridhar Ranganathan, today Vice President, Product Management, InMobi, who had led the maps development teams at Yahoo! At all multinationals, he says: "There is a 'headquarters' and 'the rest' distinction. At Yahoo!, it was Sunnyvale and the rest. After talking to many of my friends I feel it is the same at Mountain View (where Google is headquartered) and Redmond (Microsoft)." InMobi, on the other hand, was a company creating a global product from India. "I wanted in and I got in." Of InMobi's 13 top executives today, including the four founders, three are from Yahoo! and three from Google. By early 2008, mKhoj - it changed its name to InMobi in 2010 - was receiving validation. The nature of the mobile advertising business had allowed it to register a presence in nine countries from the very beginning. "We wanted to be a global company. We had seen what happens when you keep your focus narrow, and we were not making the same mistake," says Tewari. The company quickly expanded its reach to 25 countries, including the US and Japan, with Tewari, Singhal and Gupta criss-crossing the world and Saxena rapidly evolving the technology for scale. InMobi's first customer in the US was mobile video site VuClip. Ashwin Puri, VuClip's Global Head for Advertising, says: "For a mobile Internet portal of our scale that gets traffic from over 200 countries, effectively monetising through ads is all about being able to optimise eCPMs (effective cost per thousand impressions), network latencies and fill-rates. InMobi's global footprint helps us increase monetisation across geographies." Gupta, Vice President, Business Development, says it helped that InMobi began early in the game. It was actually not so early. Omar Hamoui had started mobile advertising pioneer AdMob in California in 2006. Before 2009 ended, Google had bought out AdMob for $750 million. InMobi was no longer competing with a well-funded rival start-up, it was competing with the big daddy of the Internet advertising space. At InMobi, the focus remains singularly on cranking up mobile ads: it generates around 50 billion ad impressions every month and serves over 100,000 mobile websites and applications. Insiders say the company is on the verge of making profits, but an aggressive expansion strategy might mean a few more years of belt-tightening. As Google's purchase of AdMob was being completed, InMobi raised an additional $10 million from KPCB and Sherpalo. "Mobile advertising is a huge opportunity the world over as consumers shift to using smartphones and tablets, and InMobi is a global player," says Sherpalo's Shriram on email. It is a Bangalore-based company that runs a mobile advertising platfor m. It started as mKhoj, a mobile search company in early 2007. How does InMobi make money? How is InMobi different from other ad networks? While InMobi claims its technology is superior, in this game a lot depends on how many adver tisers and publishers are on your platform. InMobi has grown superfast: it has 16 global of fices and over 100,000 publishers and advertisers in 205 countries. In this business, siz e begets size. Ask Google. Why is InMobi in this magazine? SoftBank invested $200 million in it this September- one of the largest investments anywhere in the world this year. What attracted SoftBank to InMobi? It is the only independent ad network out there with some scale. And, it is growing capabilities: it recently launched PaySmart, a mobile payments platform in 25 countries (not India), and acquired 'Sprout', a company that designs in HTML5 to help advertiser s create landing pages as well as innovative ads on mobiles and tablets. Can InMobi hit $1billion revenues before 2015? If it maintains its 10 per cent market share, yes. The global mobile ads industry is predicted to touch $15 to 20 billion by then. Unless someone makes it an of fer it can't refuse. Sure, the Bangalore company counts the US as its biggest market, but its strategy to focus on Asia and Africa as well is paying off. In Indonesia, Asia's biggest market for third generation phones that offer high-speed data, InMobi is extremely strong; India makes for five per cent of its revenues. So too does Japan. Tewari says the US and Europe will remain big markets but main battles will be fought elsewhere - and financed through the $200 million infusion. "Once we use this money to grow, it could change our profitability timelines but this money pretty much guarantees that InMobi will be around for years to come," says Sharat Khurana, Vice President, Finance. If the SoftBank funding ensures longevity and finances the tearing expansion that InMobi is undertaking - and mobile advertising continues to grow like it is doing - InMobi could be the answer to the 'When will India produce a Google' question asked often in Indian boardrooms and living rooms alike.